As you know, one of the most delightful repasts for me is a traditional British-style afternoon tea. A beautiful table laden with sandwiches, savories, scones, pastries and a big pot of properly made black tea is truly comfort food to those of us who have developed the habit. I made these for an afternoon tea party last week, and they were a hit! 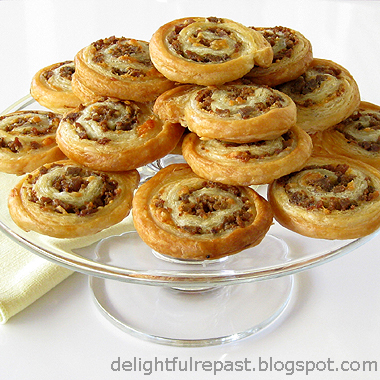 These savory spirals are also a perfect little cocktail bite to go with your preprandial beverage of choice. Made with frozen puff pastry (homemade or storebought), they're quick and easy to put together. I wasn't able to find any sausage that day that met my requirements (ethically, humanely, sustainably produced pastured pork), but I found pork shoulder that did. So I bought a pound of it and made my own homemade sausage. Made it a little spicy since each pinwheel has just a couple teaspoons of sausage. If you're using a sausage you haven't tried before, be sure to cook up a bite of it to see how it tastes. Then season it to suit yourself before proceeding with the recipe. What kind of sausage do you like? Mild or spicy? In casings or not? Pork, poultry, game? 1 In small skillet cook sausage, breaking it into small pieces, until browned. Drain any excess fat on paper towels. Set aside to cool. While sausage is cooling, thaw pastry at room temperature for 40 minutes. 3 Roll evenly toward the clean edge, wet that edge lightly with water and seal the roll. Wrap it in the square of foil. Place in freezer for 45 minutes before slicing. If you're as persnickety as I am and want to ensure perfectly round slices, split an empty paper towel roll and place your wrapped pastry roll in it, holding it closed with a couple of rubber bands or pieces of kitchen string. 4 Preheat oven to 400 degrees. Line a large baking sheet (I use an 18x13x1-inch heavy-duty half-sheet pan) with parchment paper. Whisk together egg and water. Cut the partially frozen roll into 24 1/2-inch slices. 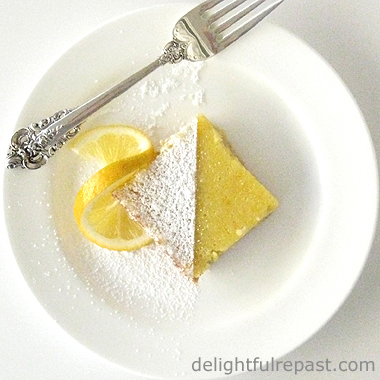 Place slices about an inch apart on prepared baking sheet; brush with egg mixture. Bake at 400 degrees for about 15 minutes, or until golden brown. Cool on wire rack for 10 minutes. Can be reheated at 300 degrees for about 5 minutes just before serving. Note: Another cocktail or teatime savory made with puff pastry is this Tomato Tart. 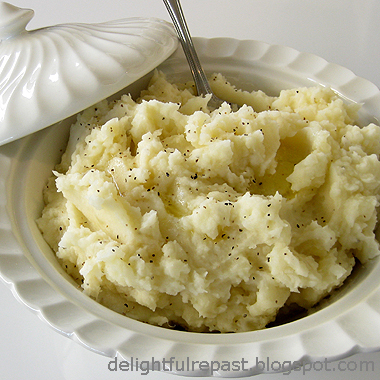 Perfect Mashed Potatoes - The Perfect Accompaniment to, Well, Everything! "Mashed potatoes? Who needs to read a blog post about, or get a recipe for, mashed potatoes? You just make them, right?" Well, judging by all the bad ones I've eaten in my life, No! Though, truth be told, I even rather like some of the bad ones. But plain old mashed potatoes--not a fancy, enhanced version--can be stellar. If you grew up with really good mashed potatoes, as I did, you know what I'm talking about. My mother made them so well that when I had them away from home I was stunned to discover mashed potatoes could be bad in any number of ways: bland, watery, lumpy, gummy, gluey, gooey, runny. Of course, there's nothing difficult or even tricky about making mashed potatoes. It's just a matter of making them with care. I learned that from my mother, who had a way of making everything taste better than anyone else's version, even something with identical ingredients. Just taking an extra few seconds to dry out the boiled potatoes, an extra few strokes of the masher to get out those last lumps, another moment to taste and adjust the seasoning--a little care makes all the difference. Apologies to many of you, I'm sure, but why put garlic in mashed potatoes? I'm sure there's garlic in the main dish. A meal should have a variety of flavors. If one dish has garlic, the others need not. I've been disappointed by many an expensive meal where everything--bread, main dish, side dishes and salad--was loaded with garlic. C'mon ... there are other flavors! 1 Peel, rinse and quarter the potatoes (cut large potatoes into 6 pieces). Put them in a 3-quart saucepan and add 1 teaspoon salt and cold water to cover. Bring to a boil and simmer, loosely covered, about 20 minutes or until potatoes are very tender. 2 During the last 5 minutes, heat the butter and 1/3 cup of milk until the butter is melted. You may need to add up to another few tablespoons of milk at the last to get the proper consistency, but don't heat it with the butter as you might not need it. 3 Drain the potatoes and return them to low heat to dry the moisture out of the potatoes. Remove from the heat. Put the potatoes through a ricer or food mill, as I used to do when I was really fussy, or use a potato masher to mash them thoroughly. With wooden spoon, beat in the heated milk and butter and 1/2 teaspoon each salt and coarsely ground black pepper (maybe start with 1/4 teaspoon). You may need to add a little more milk to get the consistency you like. Taste and adjust seasoning. Note: A few things that go beautifully with mashed potatoes: Chicken Fried Steak, Boeuf Bourguignon, Braised Brisket, London Broil, Pan-Seared Ribeye Steaks, Pork Chops and Gravy, Short Ribs Braised in Wine. Summer might be over, but it's still ice cream weather. My Southern genes have been coming out lately, so I made my banana pudding ice cream, the frozen version of that quintessential Southern dessert. And I used all organic ingredients, including the vanilla wafers. Really ripe bananas have the most flavor, but my organic bananas were still a bit green in spots and not quite soft enough. To instantly "ripen" bananas and intensify their flavor, just put them on a foil-lined baking sheet in a 400-degree oven for about 10 minutes, or until the skins blacken. Let them cool while you make the custard. Three medium bananas, just over a pound total, made one cup mashed. This is my new favorite hot weather comfort food dessert (if you don't count watermelon, that is). What's yours? Check my Recipes index page for more ice cream, sherbet and frozen yogurt flavors. 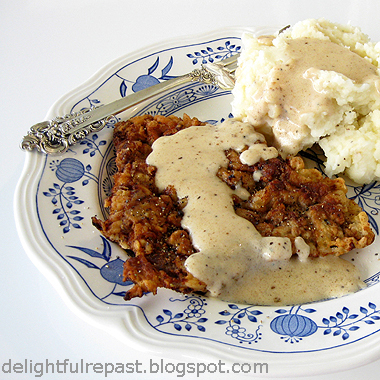 And come back next week for my current favorite Southern comfort food meal! 1 In heavy-bottomed 2-quart saucepan, heat milk just to a simmer. 2 While milk is heating, in 1.5-quart bowl whisk together sugar, cornstarch and salt. Whisk in the egg yolks until mixture is smooth. 3 Whisk hot milk into egg mixture, then pour mixture into the saucepan. Over medium-low heat, stir constantly until mixture thickens and registers 170 degrees on instant-read thermometer, about 10 minutes; do not boil. 4 Stir in cream. Strain custard into medium bowl (I use a 2-quart glass measure to make pouring into the machine easier); whisk in mashed banana, rum (if using) and vanilla extract. Cover and refrigerate until well chilled, at least 8 hours or overnight. 5 Assemble the Cuisinart ICE-21 Frozen Yogurt-Ice Cream-Sorbert Maker; turn it on. While it is running, pour the chilled mixture through the spout. Let mix until thickened, about 20 minutes. Or follow the directions for whichever brand ice cream maker you have. 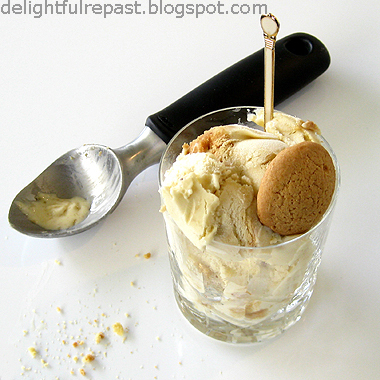 If you have a KitchenAid, you can use their KitchenAid Ice Cream Maker Attachment. 6 Transfer the soft ice cream to a freezer-safe airtight container, layering in the crumbled vanilla wafers as you go, and place in freezer for at least 4 hours. Even after days in the freezer, this ice cream was very scoopable and did not need to be left out for 15 minutes before serving. Note: The scoop in the photo above is the OXO Good Grips Solid Stainless Steel Ice Cream Scoop, the best I've ever seen; even works on hard ice cream.